Contusions occur quite often in horses, and generally speaking do not give rise to grave concern. Bruises, swollen elbows, capped hocks or lumps, and other kinds of reactions to commonly suffered trauma are frequently observed by horse owners. The injury suffered by the animal may be caused by a myriad of everyday events, such as kicking in enclosed areas or simply the act of lying down. These contusions are nowadays referred to as hygromas. Behind this veterinary term is the frequently observed damage of the synovial bursa which is located underneath the skin of the hock and elbow and which serves to prevent undue pressure to the tendons caused repetitive movement. Injury to the bursa results in an increase in fluid within this sac, and swelling is observable. While the simple swelling will eventually go down, a puncture wound to the bursa will frequently result in serious infection which decreases the odds of a speedy recovery and instead will present several difficulties to recovery. Horse owners will need to be diligent in watching for contusions. They will present in the beginning as hot areas on the horse’s body which are tender to the touch. Frequently this is accompanied by temporary lameness. When you first notice such hygromas, the first course of treatment is the elimination of the known causes of the trauma, followed by cold hydrotherapy. Resting the horse will permit the swelling to go down. After the pain has been stopped and the contusion is cool to the touch, you may wish to treat it with DMSO and also with steroid injections directly into the affected bursa to dramatically reduce the swelling of the sac. As is always the case, an ounce of prevention is preferable to a pound of cure. This, if you are planning on transporting your horse by enclosed trailer, be sure to use padded leg wraps. Review your horse’s shoeing to ensure that it is proper, and also use pastern roll guards to eliminate or greatly diminish the occurrence of elbow injuries. If the damage to the elbow has already happened, you will be able to reduce the odds of re-injuring it by shoeing your horse with specialized shoes that differ from common ones by having the heel removed. 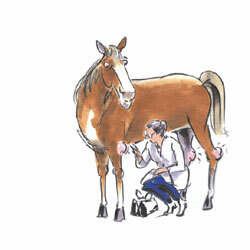 Read the next horse health tips article on Alternative medicine.